One of my favourite little moves on a skateboard is the humble check slide (though I'm much better going frontside than back). This educative nugget on the fine art of sliding skateboards comes my way thanks to photographer Darren Burdell, a long-time skater and, it is rumoured, occasional pyromaniac (only when safe and legal). What is a short walk? A Short Walk or, as it should properly be called, www.ashortwalk.com, is an innovative product design company set up in 2003 by Dan Dicker. Dan left his previous job as a senior designer with Dyson to realise a long-held dream: to set up a business, and live, ashortwalk from the beach. One of the company's first products, a range of wall-mounted tide clocks, was a runaway success - not least among surfers. Now Cornwall-based ashortwalk has launched a new Coastal Weather Station aimed at providing unique weather information for the enjoyment - whether as a visitor or inhabitant - of our rich and varied coastline. The Coastal Weather Station encompasses a barometer, a tide clock and a conventional clock, combining aesthetic appeal and functionality. It'll set you back £44.95 but I reckon that'd be money well spent. One of the most striking images at Lucia Griggi's show at The Secret Spot in St Ives is this one, entitled Surfer-Sofa-Woman. The show is well worth checking out so get along if you can. I posted a while ago about Susan Chaplin, a surfer, excellent writer and resident of Tortola in the British Virgin Islands (to which, if I understand correctly, ADR of one of the world's best surf mags is shortly moving). Appropriately enough, given that today marked the beginning of a new (this time it's serious) fitness campaign under the tutelage of Stef Harkon, Susan drops me a line about her latest inspirational challenge. She hopes this October to be first to cross the 30-mile channel between Guadeloupe and Monserrat on a paddleboard. News reaches me of a scandal that raises a smile. It is salacious, so please don't read on if you are easily offended. A married Lothario d'un certain age had been enjoying intimate moments with a delectable woman some years his younger. Lothario's wife had her suspicions and, far from going to London one morning (as was supposedly her intention), she doubled back to the marital home, there to find the keys to the couple's boat missing. She speedily drove to the said boat's mooring, and, with the utmost stealth, boarded it. She crept alongside the cabin - stepping over Lothario's cherished 6'6" thruster - and peered inside. There she found Lothario and his lady friend at one with each other rather than the ocean. Like any sensible person, she immediately took pictures of the cavorting lovers with her mobile phone. These will apparently now be used in divorce proceedings. A friend of Lothario's heard this tale of oceanic intrigue and, herself being a woman of the world, suggested that the pictures be deleted, Lothario end his illicit relationship and the formerly happy couple try to repair their marriage. After all, she said, surely it wasn't as if the duo were engaged in some kind of deviant activity. Wasn't it just a bit of fun, couldn't it be forgiven? A trusted source said that no, it was nothing particularly untoward. "What, then, is the problem?" said Lothario's friend, evincing notable, and perhaps commendable, liberalism. "Put it this way," said the source. "She couldn't speak, and he couldn't hear anything." A sight for sore eyes and, doubtless, a handy mobile phone. To illustrate yet further their uses here are some shots taken by Welsh writer Tom Anderson of swell generated by Hurricane Dean as it hit the east coast of America. 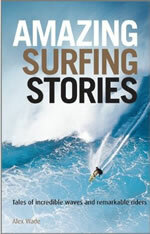 Tom was recently in the States researching his second surfing book. Curiously, he used to supplement surf trips by working as a private investigator, but this fact is as relevant to the above tale as Lothario's thruster. It remains only to say that if you ever find yourself on a boat with consensual carnal intent for someone Who Is Not Your Partner, get your mobile phone out and book a hotel room. Quick. "I hate writing. And I'm a better surfer than you." I'm just back from Lucia Griggi's exhibition at The Secret Spot in St Ives. This is a tremendous show full of energy, colour and vitality in a great space, and is well worth a visit. Good work by Geoff and Rowena, whose daughter Tassy is, I learn, now not only a decent surfer but also into kick-boxing. While there I chatted among others to Tony Plant, who tells me that Surf Twisted apparel is now available and, just as importantly, that he was disappointed not to see more from Harry on this blog by way of his attempt to earn a Surftech JC. Harry totally failed to earn this board through sheer negligence (he did next-to-nothing), and enters the comp at Fistral tomorrow on my old Kamikaze. Tony asked him why he hadn't got his act together, to which Harry shrugged and said: "Whatever." This prompted gentle fatherly mocking (as in, "Harry, all you had to do was write a little on the blog, it would have been excellent for your education and I might have bought you a board! "), to which Harry uttered lines that would inevitably plunge any writer-surfer Dad into despair. "Dad, I hate writing. And I'm a better surfer than you." "Dad, blogging seems pretty pointless to me. If you didn't spend so much time blogging you'd be a better surfer." A man I have a lot of respect for - surf snapper Al Mackinnon - has got his long-awaited website up and running. Check it out here. Al has led a colourful and at times enigmatic life, and this year became the first European to win the coveted Billabong XXL award for his photograph of the biggest wave ever ridden in Africa. I've travelled and worked with Al, and two of his sayings regularly occur to me. One, that "too many people have forgotten what surfing is all about - it's about being stoked," and two (uttered in circumstances when I'd lapsed from the straight and narrow), "Do the next right thing and you'll be OK."
I like the idea of doing the next right thing, and tried to get this across to the prisoners at Parc on Monday. It was really rewarding visit and I'm hoping to return soon for a writer's workshop. After the talk, I sped away to Walcot Amateur Boxing Club and trained there for the first time in a while, to mixed results: on the one hand, my upper body strength was undiminished, but on the other (thanks to a series of timed tests and runs), I now know that I am officially the slowest runner in the club. My lungs felt pretty tricky today in a bigger-than-it-looked swell at Sennen Cove. In fact, for the first time ever, I had a bit of asthma in the water. Anyone else out there bedevilled by this irksome complaint? I had asthma as a small child, then it went and I was an athlete (hard to believe after training the other night), then it came back whenever I had a cigarette (bizarre but true: there is a connection between smoking and asthma). Despite not having smoked for some time and being in reasonable shape, today's paddle out led to wheezing. Quite why this should be so I have no idea, but it was no fun at all in the water. Needless to say my surfing was duly affected, but I did the right thing and came in to catch my breath. Then I paddled back out and caught a lovely long right-hander on a sizeable wave that made the whole experience excellent. Which all goes to show that if you do the next right thing in life, it does help. Nice to hear from Zed Layson in Barbados. It was thanks to his comments about UK and Irish surfers that I got the idea for Surf Nation. Here are some shots from his place at Surfer's Point. As he says, the sun was hot, the water warm, and only two guys were out... Sounds very, very nice. See Zed's Surf Travel for more info. Off I go to Parc Prison in a minute. Then it's a couple of days in London. I always feel depressed whenever I'm about to go anywhere, but I think the prison visit will be very interesting and as for London, in my line of work it's unavoidable. When I'm back I have Lucia Griggi's exhibition at The Secret Spot St Ives to look forward to. Lucia splits her time between Newquay and Venice, is as cool as she sounds and takes some great shots. More on this later in the week but the show runs from 21 September to 11 November. Some enjoyable ocean-going activities today thanks to an open day hosted by the Cape Cornwall Pilot Gig Club. Gig rowing is something I enjoy but never seem to have enough time to do. Then it was yet more carving around on the Path 37 (honestly, this board is addictive) before a trip to the local beach to see if George the dolphin was around (yesterday he swam in to the bathers at Porthcurno and must have played with them for at least an hour). No sign of him and then, it being the last day of the lifeguard season at Porthcurno, the heavens opened. Stef packed up the gear, put away the flags and locked up the hut. Summer is over. But as I write this Harry is surfing at Sennen - and he's had a great summer of surfing. This is in a large part down to his being a member (as is younger son Elliot) of the Sennen Surf Cadets. Dave Muir, his father and numerous Dads (not to mention the instructors, who run the Saturday Cadets' sessions on a voluntary basis) have done a great job throughout the summer. The stoke they bring to surfing is ever-present and I'm sure I speak for many local parents in thanking them for their fantastic efforts. So, Sam Smart and his surf school. Sam has taken both my boys surfing on many Sundays and has helped bring them along tremendously. Training on the beach with him last Friday morning also reminded me that, at 41, boxing really is a young man's game, but that's another story. A word of advice. If you're lucky enough to live down this way book your kids in early for next summer's Surf Cadets. Meanwhile, albeit that today has a slightly wearisome, it's-all-over feel, the truth is that it isn't. Yesterday gave a hint of the September and October swells around the corner - and the good news is that there's space in the car park again. So see you in the water this autumn. PS Message to the bloke I dropped in on yesterday: sorry.